Willa Hillicrissing comes through and describes The Five Levels of Mastery: cryptic, nocturnal, shape-shifter, sage, and wraith. Willa and Bashar discuss in-depth the specific symbols, energy states, and explorations involved in her mystery school training. Bashar and Willa answer your questions. Has Willa tried divinorum? What is divinorum? 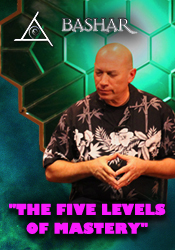 Can we achieve the Five Levels of Mastery without using divinorum, or using different tools? I’d like to feel my emotional body more. Sometimes it feels like there is a disconnect. What is the easiest and the quickest way to raise your frequency? If it’s so easy, how come we’re not always doing it? How would I know that I’m almost there? One night you visited me, and you asked me if I wanted to go with you. I got out of my body, and there you were. Bashar confirmed for me that it was you. Was it you? What are my gifts? I’d like to use my intuition, but I don’t trust my automatic writing. Last time I talked to Bashar he said that I made friends with death. Can you expand on that? I’m confused about manifestation, can you help me with it? Since we’ve talked about ET contact, do you think there’s going to be any contact with the Anunnaki? Would they come to the Earth? Can you give me some information about the Ark of the Covenant that was sent to the South Pole? Can you give me some information about what that is, the Ark of Gabriel that you called by another name? I heard that there is going to be an explosion on the Earth. Is that true? I feel pent-up energy buzzing over my third eye. I feel like I’m about to take off like a rocket. What is that? How can I ground those energies? Do we all have divine gifts and a soul contract that we are being awakened to? What is my connection with Willa? What brought me to this place at this time, that I needed to leave Ireland and be here? My organization is thriving and doing much better. And I’ve been getting a lot of recognition and accolades. Recently I just gave a Ted Talk. Where is the money? My ears are becoming more sensitive, can you tell me why? How can I support a family member who is addicted to drugs? You’ve said your ship is above Sedona, and there are many others. Where are the other extraterrestrial ships located above Earth? Whose are they, and what is their purpose? What is the race of our hybrid children called? Do they visit Earth? If so, why? Can we connect as conduits for the hybrid children to see through our eyes? What do symbols have to do with our experience?